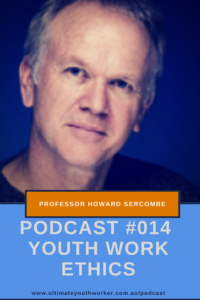 In this episode of the Ultimate Youth Worker Podcast ‘Youth Work Ethics’ Aaron speaks with Professor Howard Sercombe about his over two decade looking at and developing Youth Work Ethics documents. Howard Sercombe is a leading youth work academic and practitioner. 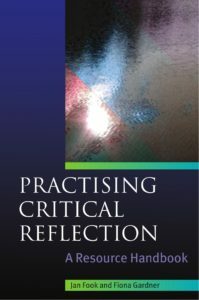 He has been a pioneer internationally in thinking about professional ethics for youth workers, and was involved in drafting codes of ethics for youth workers across Australia and in Scotland, England, South Africa, Zambia and New Zealand. His book, Youth Work Ethics has been widely influential. He has also published widely on the sociology of youth, including the construction of youth in the media and the emerging influence of neuroscience. He and his partner, broadcaster Helen Wolfenden, have just relocated to Sydney after ten years in Glasgow. He currently holds an honorary Professorship in Education with the University of Glasgow, and is doing primary parenting for Oscar, 4 and Timothy, nearly 2. In todays episode Aaron and Howard speak about the development of the Fairbridge code of ethics used by many youth work associations worldwide. How did the code come in to being? Why do youth workers need to think about ethics? How can youth workers think ethically in their day to day practice? Professional youth workers must think about the concept of ethical practice every day. Codes of Ethics are a significant way for the young people we serve to know what we can and cannot do. They also give youth workers a great framework for professional supervision and reflective practice. You can find more information about Howard on LinkedIn. Here are links to some of Howard’s latest articles that have bearing on todays podcast. 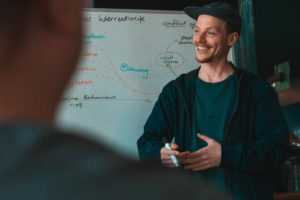 In this episode of the Ultimate Youth Worker Podcast Aaron speaks with Ben Lohmeyer from Tabor College of Higher Education about his research into youth work and power. 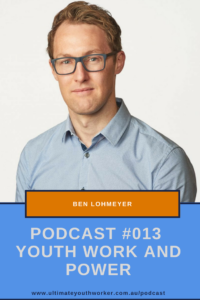 Ben Lohmeyer is a critical youth sociologist and youth worker. He is a PhD candidate at Flinders University and the Program Coordinator of the Bachelor of Applied Social Sciences (Youth Work) at Tabor. Ben’s research interests include: youth, governance, violence (personal, structural and neoliberal) and youth work practice. Ben has worked across a range of youth work settings including alternative education, alternative accommodation and peace building. He has experience facilitating restorative justice processes, designing and facilitating peace building programs as well as grant and policy writing. 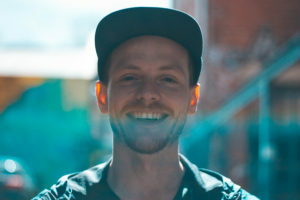 Ben has is currently completing his PhD in Sociology at Flinders University focussing on youth and neoliberal violence. In todays episode Aaron and Ben speak about youth work and power. How do youth workers recognise power issues? What can youth workers do when power is imposed by neoliberal structures? How can youth workers show genuine concern in the face of power imbalances? Youth workers must wrestle with the concept of power as it is a significant issue for the young people we serve and in doing youth work with integrity. Here are links to some of Ben’s latest articles that have bearing on todays podcast. 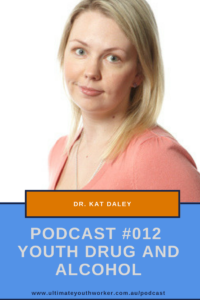 In this episode of the Ultimate Youth Worker Podcast Aaron speaks with Dr. Kat Daley from RMIT University about her research into youth drug and alcohol abuse. Dr Kat Daley is a Lecturer in the School of Global, Urban and Social Studies. She researches issues of marginalised youth including, substance abuse, self-injury, homelessness, gender and sexual abuse. Her book, ‘Youth and Substance Abuse’, was published in 2017. Kathryn teaches courses in social research and policy. Prior to academia, she worked in youth alcohol and other drug services. In todays episode Aaron and Kat speak about why young people tend towards use that is problematic and long term. They look at the particular patterns in young women with problematic drug use that arose from Kat’s research, the key issues surrounding problematic use in young men and how these two groups approach dealing with their substance use problems. It is through such great research that youth workers gain insight into our clients. A special thanks to Kat for taking time out of her very busy schedule to be our first academic on the cast. A core part of our mission with the Ultimate Youth Worker Podcast is to make academic work more accessible to the masses. If you enjoy this cast don’t forget to leave a comment in the section below and share the link with your colleagues.